Many of us spend about one third of our lives at work and another third sleeping, so our relationships at home and with our families have a significant impact on our work, our faith life, and our ability to sleep. It’s the circle of life. As much as we may want to check our personal lives at the door, it’s impossible to do so, just as much as it’s impossible to leave work and not let the stresses or celebrations of the day impact us at home. We’ve recently released our 2nd book in the JoyPowered™ series, The JoyPowered™ Family. In this book, we explore the connections between our work and our family. Gallup® reports that people who focus on their strengths are three times as likely to report having an excellent quality of life and six times as likely to be engaged in their jobs. The statistics may not be the same, and we may put different weight on our strengths at work versus at home, but the end result is the same. A focus on our strengths makes us better, a better quality of life helps us be more engaged at work, and being more engaged at work improves our overall quality of life. In his book Are You Fully Charged? 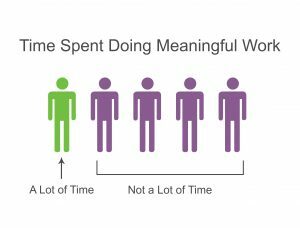 : The 3 Keys to Energizing Your Work and Life, Tom Rath shares that only one out of five people said they spent a lot of time doing meaningful work the day before, and that the vast majority of employees say their company is a detriment to their overall health and well-being. One out of five? Seriously? It makes me so sad to think of it. Of course, we all have bad days, and not everyone has the perfect job, but referring back to the research in my first book, JoyPowered™: Intentionally Creating an Inspired Workspace, there are so many people who are “settling” and don’t realize the impact this makes on their whole life – not just their time at work. We recommend that you read the first JoyPowered™ book if you are in an unhappy work environment or are not finding joy in your work, as we provide many specific ideas on how to turn this around (and, by the way, it doesn’t always mean quitting!). Am I a nurse or a healer? Am I an accountant or a problem solver? Am I a teacher/trainer or a developer of others? Am I a cashier/receptionist or do I help create a more positive experience for others? Am I a salesman or do I provide solutions for others? Think of the difference this simple approach might make in your own mind, or in the thoughts of your family. Take a step back to think about who is helped by your work. Does your work have purpose, and can you define it in two or three sentences? Is it true to who you are? Is it bringing joy to you? Your family? Are you using your gifts and talents on a daily basis? Would your family find more joy if you stayed at home or if you worked more so that you could provide more? Is your travel creating chaos for the rest of the family? Does it mean less time with children, parents, grandparents, and/or siblings? Are you serving important causes? Protecting others? Saving lives? Are you creating joyful moments in the lives of other families? These questions can all be difficult – in the moment or over time – as a yes answer to one might mean a no answer to another. What I do know, though, is that if you are not finding fulfillment or joy in your work, then it’s likely very visible to your family and those around you at work as well. So, please, don’t settle. Do something about it. 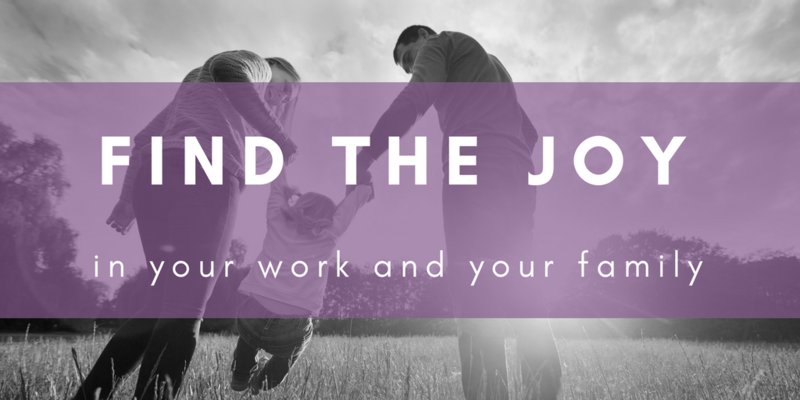 The joy you find in your work can also create more joyful moments in your family. You have full engagement when you find your calling. Where I think we might struggle, though, is in defining “our calling.” I think we want to label it as a profession or a role instead of who we are being. See the examples above where we encourage you to think in terms of healer, problem solver, or developer rather than nurse, accountant, or teacher. It might be that “healer” is your calling, but not being a nurse, so consider alternatives to fulfill that calling. When my daughter was in the sixth grade, someone asked her what she wanted to be when she grew up. Her response was a truly JoyPowered™ moment for me and was one of my best mom moments. Keeli said, “I’m not sure exactly, but I know I want a schedule like my mom’s; she works a lot, but she is always able to be there for us and she enjoys her work.” In hindsight, I think my eleven-year-old could feel that I was finding joy in my work, and that I was also able to bring that joy home to my family. Can you say the same?